In 2003 I went back to Barcelona to study Contemporary Art Practices. On the first day of school I met Dori Midnight, one of my American classmates. She was a self confessed “witch”—an intuitive tarot card reader, counselor, and healer. She was definitely one of the most interesting (hence, memorable) people in the group, but what she said to me on the first day was what struck me most about her. I had barely said hello when she said, “Hey, I had a dream about you last night. You were making floating sculptures.” I laughed because, 1) we had just met so how could she dream about me? and, 2) sculptures? I had never made a sculpture in my life! She insisted that that was what she saw and we left it at that. To cut a long story short, I did end up making sculptures, not because she planted the idea in my brain, but because at that moment I hadn’t received the painting materials that I shipped to myself before leaving Manila and that I really enjoyed sculpture class. I was a practicing graphic designer in Manila so it was such a joy to work with my hands. And I found out that I could express myself better though 3D art. We developed a friendship while doing the course and before she went back to the US she gave me a precious gift: a deck of her Dirty Tarot cards. It is probably one of the most unique decks out there in the world; she designed it herself. It doesn’t have the Major Arcanas nor the Minor ones. She divided her cards into special categories (with each containing the four elements: fire, earth, air, water): body, home, food, transportation, sacred space, clothes, transformation, altered state, souvenir, and lucky omen. It looks nothing like a traditional tarot deck, but it’s the most responsive of all that I’ve seen. I was a dabbler in the art of divination, but I never really took it seriously until I got this. I didn’t read everyday, mind you, but I studied it and would occasionally read for a few of my chosen friends. And they all loved it. I eventually lost touch with Dori (My bad: I am not really good at exchanging emails; this was before Faceook), but I kept her cards close to me. I shelved my deck permanently, though, about 2 or 3 years ago. I was going through a rough patch, felt overwhelmed by everything, and felt totally disconnected with myself. My intuition was nonexistent and I refused to do any inner work. Fast forward to last week: I receive a SPAM email from Dori’s address. I thought nothing of it. The following day an old friend asks for a reading, then about a week later another. Then last Saturday I get a personal message in Facebook from a highly spiritual and intuitive friend asking me if I still did readings. She just thought of me, she says. Strike 3 (or 4, actually). So I searched for my deck. I moved houses in October last year and could not remember where I put it. After about 3 hours (and running low on patience), I decided to look at my “trash pile” and opened an old shoe box. Lo and behold—it was there with my other neglected tarot cards. I felt guilty, but mostly relieved that I found it. I took the cards out of the pouch and it was like encountering an old friend. My brain was foggy, but I knew each one of them and I knew what to do. I definitely didn’t want to part with them again. So I promise myself to use them again, maybe not for reading other people, but for helping me reconnect with my intuitive side again. 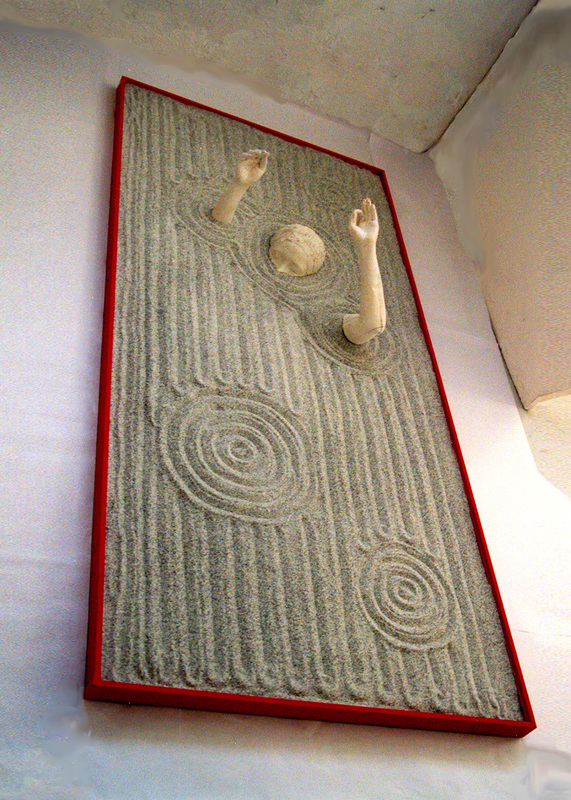 I feel as if I’ve buried it a long time ago by not writing, by not blogging, by not making sculptures, and by not reflecting on things. I would like to use these cards to make me focus on things, to anchor my thoughts. Dori gave some suggestions on how to use her cards, and one of them was to pick a daily card to meditate on. I don’t think I can do this everyday (at least not for now), so I will go for a card per week to reflect on for the rest of the week. 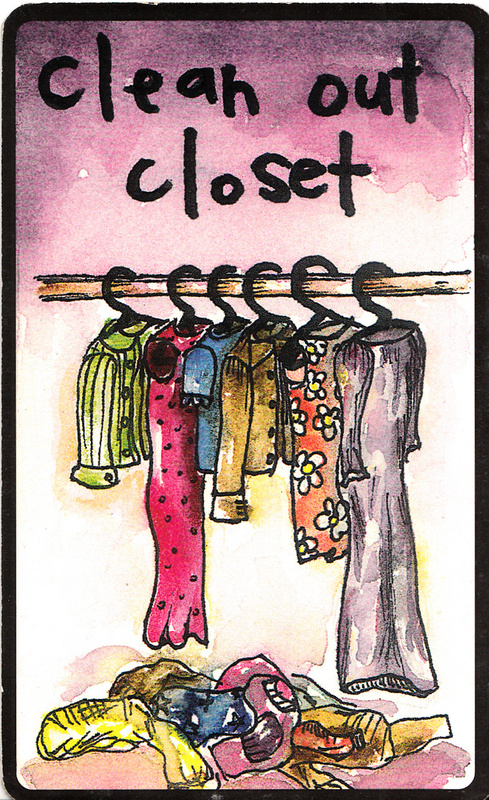 The card I got last night (Sunday night) was “Clean Out Closet.” It’s description: Distilling. Making choices. Simplification and practicality. True desire. Purifying ritual to make more room for what you really want and need. Having intention in purging and consuming. I’m getting goosebumps while I am writing this; it’s synchronicity at it’s best. This is exactly what I’ve been mulling over, not just physically, i.e. sorting and throwing things out, but also emotionally and spiritually. I need to distill a lot of thoughts and make clear choices. At least the cards are backing me up on this one and are asking me to sit still and figure things out. I am grateful for that.